After women were recruited to work on farms around the country at the start of the Second World War from September 1939, the next challenge was where to house them. Some women lived in in farmworkers’ cottages or in the houses of local people, known as billets. Other Land Girls, employed by County War Agriculture Committees (WAECs), lived a more communal life with a group of women in a hostel. Land Girls outside Ripon Hostel, run by the YWCA. 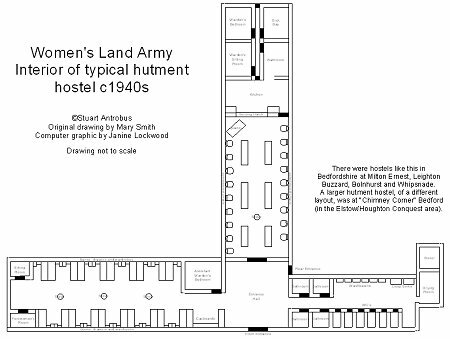 Source: Yorkshire Women at War: Story of the Women’s Land Army Hostels, p. 201. Hostel accommodation was either in specially-erected hutments or, when possible, in requisitioned country houses. 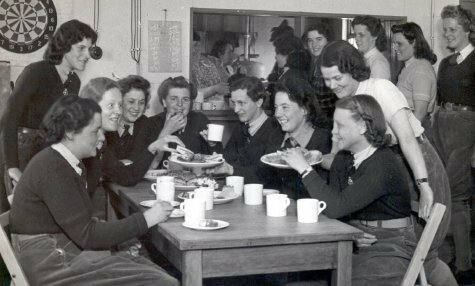 In total, around 22,000 Land Girls lived in hostels run by 2,300 members of staff. In January 1944, the WLA ran 68% of hostels, the WAEC 11%, the YWCA 21%. While there is a lot of information on hostels run by the WLA, there is much less on hostels run by the YWCA. As one of the purposes of this monthly series is to highlight previously-neglected aspects of the running of the WLA, the YWCA’s involvement seems appropriate to explore. The Young Women’s Christian Association was formed in 1877, to provide recreational and education activities for young working women. As the name suggests, the very nature of the YWCA was essentially religious, bringing women together for ‘prayer, mutual help, sympathy and Bible study’. During the Second World War, it managed hostels for munition workers and civil servants. And it was to the YWCA that the WLA turned to help house Land Girls, from October 1941 in England and from May 1942 in Scotland. The layout of a typical WLA hostel. An article reporting on the opening of the YWCA hostel at Ripon on 6th November 1941. Memoirs of other hostel Land Girls from other parts of the country certainly didn’t speak of such favourable catering arrangements. 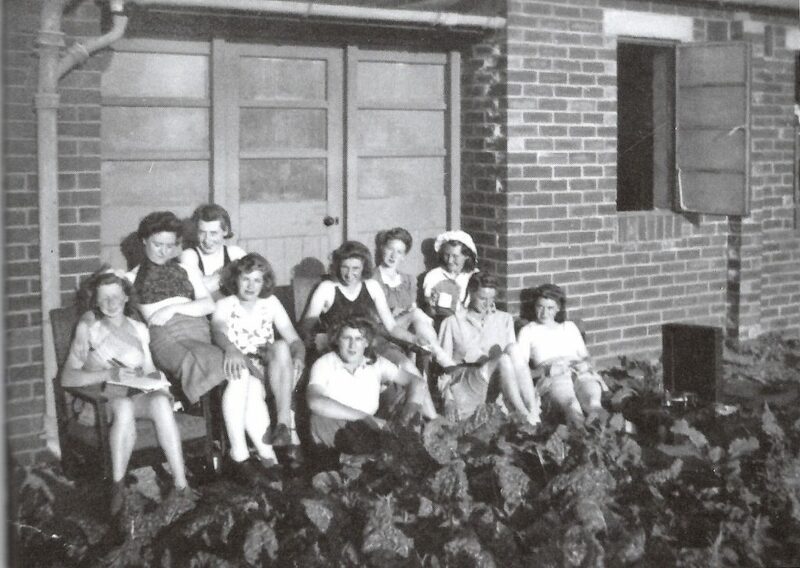 One of the first YWCA hostels to open was in Ripon in November 1941. The hostel, which was of a standard layout and housed over 40 Land Girls. The hostel included 2 wooden huts, a recreation/dining room, and dormitory. 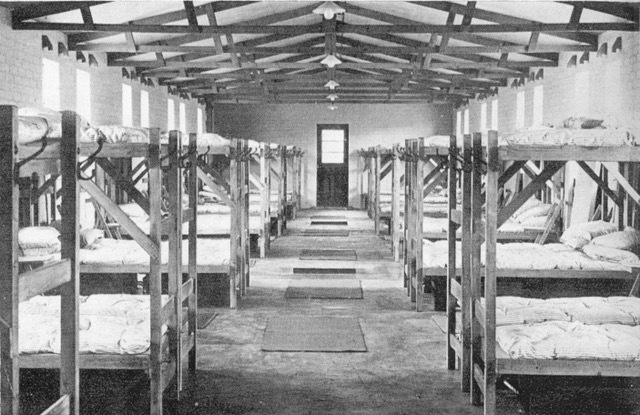 Each dormitory was then separated into cubicles, each housing 4 people with bunks. 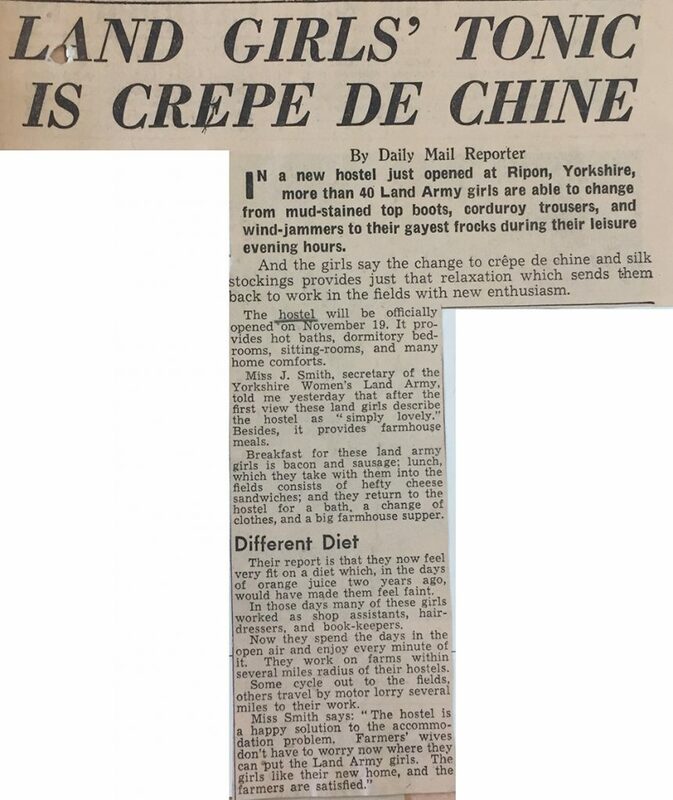 Mary Tetlow remembers how the meals at Ripon hostel were ‘well cooked and plentiful’, especially compared to the rations which she was used to back at home. Many of her fellow Land Girls spent their evenings at the hostel, as it was often too much effort to leave the hostel to go out. When a hostel became available which the YWCA could run, representatives from the YWCA made an application to the WLA to provide hostel management services. If the building was suitable (in terms of availability of rooms, heating, water supply, and other issues) the YWCA started to recruit staff and make the necessary catering arrangements. The dining room in use at Milton Ernest hutment hostel in Bedfordshire. Both the Warden and the local WLA County Secretary shared responsibility for the ‘general welfare and recreational activities’. To support recreational activities, the YWCA looked to hire pianos and wireless sets. Some hostels also arranged lectures. For example, in October 1946, WLA County Secretary Miss Jacob-Smith had asked for a lecture to be given to the women of Easingwold hostel on ‘Health and Happiness’. Bolnhurst Hostel, run by the YWCA in Bedfordshire from 1942 to 1949. It shows the long wooden dormitory block and brick-built ablutions block, with water tower. The interior photo showing the reality of the bunk bed facilities in a hutment hostel dormitory block. The YWCA invited Land Girls to help raise money for the organisation. In November 1943, Land Girl Ada Senior, who lived at Easingwold Hostel in Yorkshire, raised the most money. Her reward; to present the purse to the Queen at Mansion House in London in November in front of an audience including Mrs Churchill and the Lord Mayor and Lady Mayoress of London. ‘appears to have been planned by someone who has no practical knowledge of running a hostel or of what is really required’. The involvement of multiple organisations in hostel construction and administration meant there could be different judgements over what was deemed to be an acceptable hostel. Little has been written on how distinctive the YWCA approach was to running hostel, compared to the WLA. One Land Girl, Barbara Ellis, who worked in the Forestry Corps in Wareham, remembers of the YWCA how ‘my eyes were certainly opened there: what a tough bunch’. 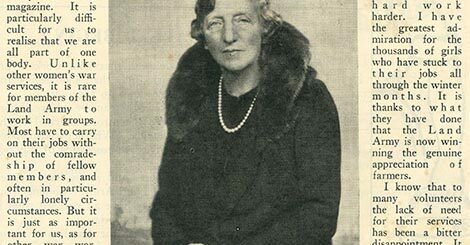 Scottish Land Girl, Nan MacFarland, commented that the women who ran her hostel were ‘very kind maidenly ladies and old-fashioned in their ideas and such like and we didn’t get a lot of fun out of it really’. Overall, the YWCA played an important part in providing practical and moral welfare to many Land Girls up and down the country. If you or your relative lived in a hostel run by the YWCA, then please get in touch to share your/ their experiences. 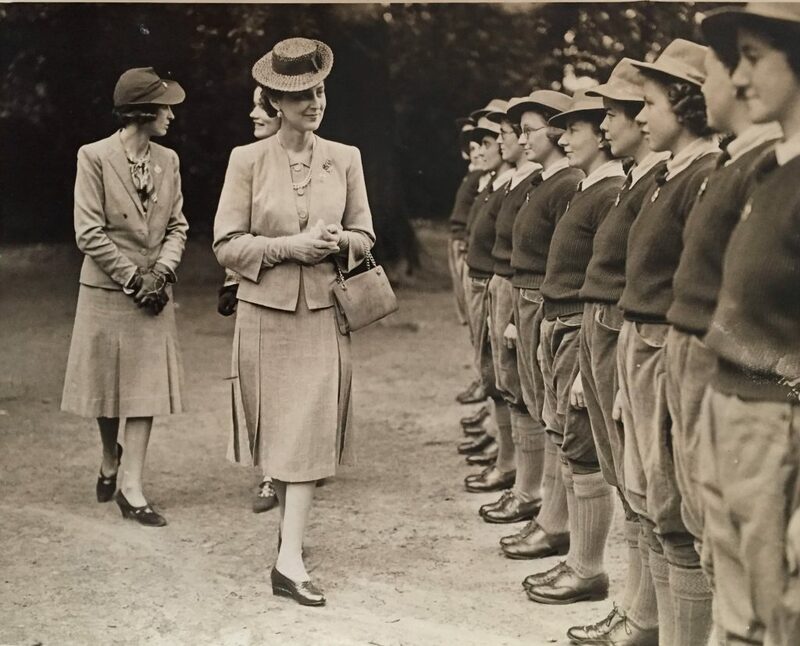 In June 1941, H.R.H The Duchess of Kent paid an informal visit to the new Y.W.C.A Land Army Hostel at Slough which was opened in response to the request of the Buckinghamshire Land Army Committee. The hostel used to be a boy’s school, but began housing 50 girls working in market gardens. It had a large recreation room suitable for evening entertainments, an air raid shelter and a pleasant garden. Source: Catherine Procter WLA Collection. 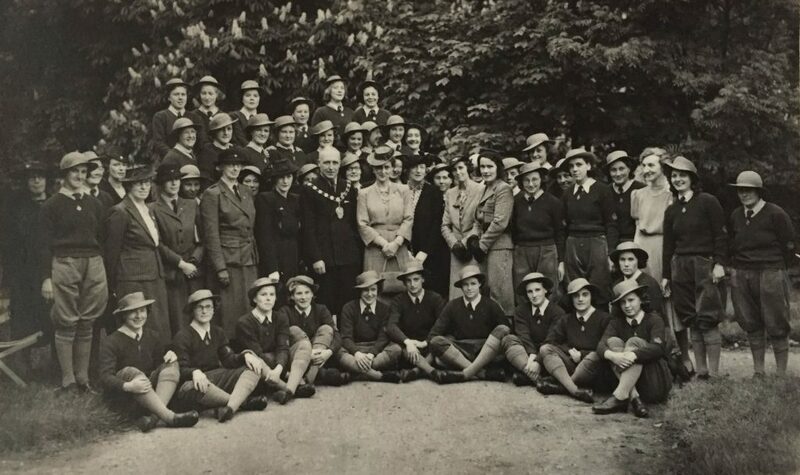 A photo of Land Girls and local officials for the visit of H.R.H The Duchess of Kent to the new Y.W.C.A Land Army Hostel at Slough. Antrobus, Stuart. ‘We Wouldn’t Have Missed It For The World’: The Women’s Land Army in Bedfordshire, 1939-1950. Copt Hewick: Book Castle, 2008. Beaumont, Caitriona. ‘Citizens Not Feminists: The Boundary Negotiated between Citizenship and Feminism by Mainstream Women’s Organisations in England, 1928-39’. Women’s History Review 9, no. 2 (1 June 2000): 411–29. Clarke, Gill. The Women’s Land Army: A Portrait. Sansom & Company Ltd, 2008. Jefferies, Marion. Yorkshire Women at War: Story of the Women’s Land Army Hostels. Barnsley: Pen and Sword Military, 2015.